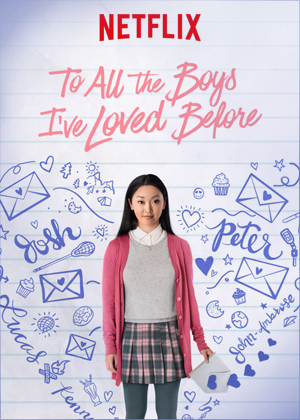 Netflix recently added a new teen heart-melting rom-com called To All the Boys I’ve Loved Before, directed by Susan Johnson. The movie is a sweet take on what many teenage girls have dreamed about: their crush to notice them. The story begins with a girl who likes a boy. The girl, Lara Jean (Lana Condor) has a massive crush on her sister’s boyfriend Josh (Israel Broussard). Jean wrote a letter to Josh confessing her love for him when she was 14 years old. Two years later, her crush has subsided and she and Josh are best friends. Margot, Jean’s sister, breaks up with Josh right before she leaves for college. With this, Lara’s crush begins to resurrect. Jean writes letters to her crushes with no intention to send them. Her writing is purely to do with getting feelings off her chest. Her mischievous little sister Kitty (Anna Cathcart) sends all of the letters out one day without telling Jean, including the one intended for Josh. Peter (Noah Centineo), one of the boys Jean wrote a letter to, approached her and informed her that he had no attraction for her. Jean told him that she wrote the letter a long time ago right after they’d kissed in the seventh grade. The next day, Josh asks Lara about the letter and she lies saying that she has no interest in dating him because she’s dating someone else anyway. As she’s saying this, Peter walks by and Jean kisses him as if to say “Hey, this is my boyfriend.” Peter kisses her back and decides to fake date her to make his ex-girlfriend jealous. Their dating spirals into actual feelings. The movie is a good heartfelt movie that makes people leave movie theatres smiling. Would highly recommend, especially for teenage girls.